How long does it take to read through and analyze 17 state plans under the Every Student Succeeds Act (ESSA)? Two months seems to be the sweet spot for many of the nation’s education thought leaders. Since the first submission window closed this spring, a number of groups, Advance CTE among them, have released their takes on the first round of state plans. Federal education policy inevitably draws opinions, advice and criticism from all corners of the country, and states’ planning around ESSA implementation has been no exception. Below we round up some of the latest takes and summarize conclusions from the first round of submitted plans. Purpose: The GAO was requested by Congress to study and report on states’ progress and approaches toward amending accountability under ESSA. To conduct the report, GAO policy researchers interviewed national stakeholders and met with education officials in California and Ohio, two states that were identified as taking different approaches to accountability. Key Findings: The report finds that states are taking advantage of increased flexibility under ESSA, though the degree of change ranges by state. The authors classify ESSA accountability development by four dimensions: 1) determining long-term goals, 2) developing performance indicators, 3) differentiating schools and 4) identifying and assisting low-performers. Purpose: To highlight strengths and draw attention to growth areas in ESSA plans, the Alliance for Excellent Education is developing ESSA Equity Dashboards that rate key components of state plans. Dashboards are available for five of the first 17 plans, with the remaining expected in August. The dashboards examine long-term goals, support and intervention, and accountability. Key Findings: The Alliance for Excellent Education highlights Louisiana’s plan for its focus on academic outcomes and the design of the state’s “Strength of Diploma Indicator.” Reviewers flagged Colorado’s long-term goals for math and reading performance. 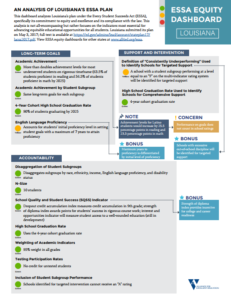 Purpose: This analysis from Results for America examines the first 17 submitted ESSA plans and evaluates the degree to which states aim to use evidence-based practices in certain parts of their plan. The analysis is based on 13 key ESSA leverage points identified by Results for America and the Council of Chief State School Officers. Leverage points include monitoring local education agency implementation, allocating school improvement funds, monitoring and evaluating school improvement, and more. However, only four states emphasized the role of evidence-based practices through Title II and Title IV and only nine states prioritize evidence when reviewing and approving school improvement funding applications. Purpose: To supplement the Department of Education’s peer review process, Bellwether Education Partners and the Collaborative for Student Success convened a peer review team of their own, drawing together more than 30 local, state and national experts to review and rate state plans. Their analysis focused on nine key elements. States are taking advantage of increased flexibility to broaden their accountability systems, focusing on college- and career-readiness, year-to-year student growth and other indicators including science, attendance, physical education, art and school climate. However, many states could not describe how their proposals would play out in practice, neglecting to specify how many schools would be identified for improvement or how federal funds would be used to increase student success. 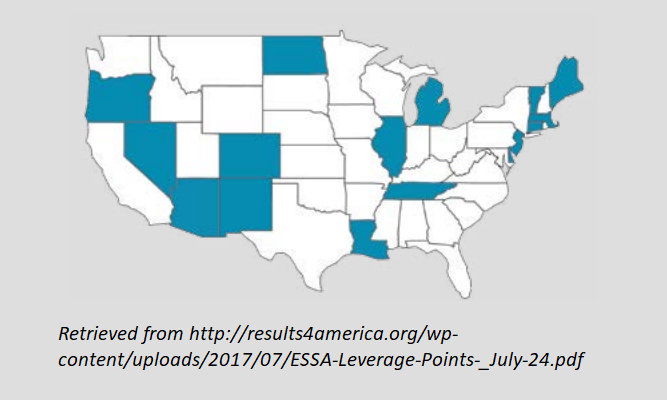 Purpose: This analysis from Achieve examines 17 round 1 state ESSA plans through the lens of Science, Technology, Engineering and Mathematics (STEM) education, pinpointing how states are leveraging assessments, graduation requirements and other goals to promote science and STEM. Several states are exploring opportunities to use grant funds under Title II and Title IV to support STEM education. Purpose: Education First, with support from the Overdeck Family Foundation, examined 25 state plans (including 17 submitted plans and an additional eight draft plans) to identify leverage points for STEM education and review whether and how states are taking advantage of these opportunities. Their review focused on four key dimensions of state plans: inclusion of state science assessments in accountability systems; including of Career Technical Education (CTE) indicators in accountability systems; inclusion of Advanced Placement (AP) and International Baccalaureate indicators in accountability systems; and STEM elements in 21st Century Community Learning Centers. Ten states are requiring or encouraging STEM activities in their 21st Century Community Learning Centers grants. Purpose: Researchers at the American Institutes for Research reviewed 17 submitted plans and three additional draft plans to get a broad perspective on how states are prioritizing certain strategies. Their analysis covered plans for accountability, STEM, school improvement, technology and more. State accountability systems are becoming more sophisticated, including indicators such as college- and career-readiness and chronic absenteeism. However, states have a ways to go to more fully develop indicators of career readiness (a question recently explored at length by Education Strategy Group and the Council of Chief State School Officers). Overall, reviewers seem impressed with states’ efforts to include more comprehensive indicators of student success in their accountability system. However, states were light on details about how their plans will be implemented and how schools will be supported to improve student performance. The remaining two-thirds of states planning to submit plans in September can draw on these findings, along with Advance CTE’s report on career readiness and ESSA, to ensure their plans are robust and sufficiently leverage all that ESSA has to offer. Last week was certainly a big one for apprenticeships! In the midst of White House announcement, U.S. Department of Labor memo and the introduction of legislation in the Senate was the release of a new report form Advance CTE – Opportunities for Connecting Secondary Career and Technical Education Students and Apprenticeship Programs. This new report was commissioned by the U.S. Department of Education and prepared by Advance CTE with support from Jobs for the Future, Vivayic and RTI International to help state and local leaders begin to understand the ways in which they could expand access to apprenticeships for high school students, and bring the CTE and apprenticeship systems into better alignment. 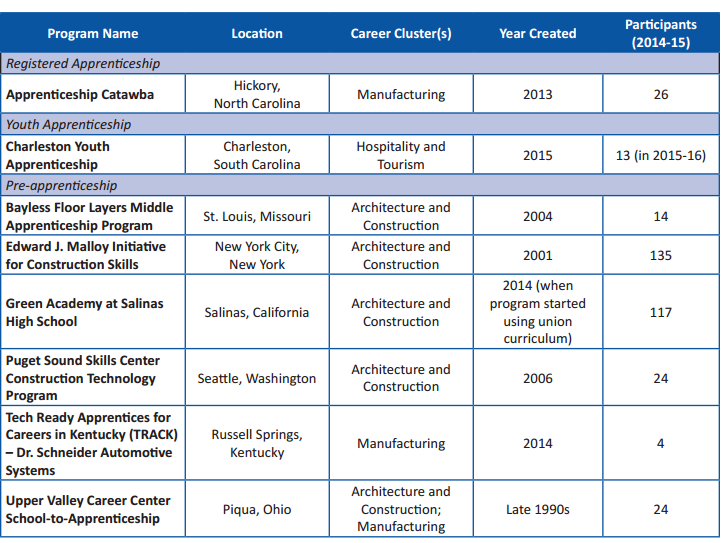 At the center of this paper are eight case studies of aligned CTE-apprenticeship programs, which Advance CTE and its partners visited last year to see how they were providing opportunities for high school students to engage directly in pre-apprenticeships, youth apprenticeships and/or registered apprenticeships. While the eight sites differ in structure, intensity and the state policy environment, there are common lessons learned that apply to any state and local leader looking to build such programs in their own communities. Programs must align with workforce demand, at the state, regional, and local levels – an lead to real employment options for students. At most sites, the drive for the program came from employers and/or labor associations seeking to bolster their pipeline of workers – and this was key to their launch and success. From Advance CTE’s perspective, aligning CTE and apprenticeship programs, policies and systems is simply common sense. It comes down to providing more pathways to college and career success for more students and for strengthening our overall talent pipeline in key industries like advanced manufacturing, IT and construction, which leveraging existing structures. But, we still see too many missed opportunities due to largely disconnected systems. This is why, even as this project winds down, we will continue to support efforts to strengthen apprenticeships, and their connections to CTE at the secondary and postsecondary levels, through partnerships like Apprenticeship Forward and ongoing discussions with OCTAE and the U.S. Department of Education Office of Apprenticeship. In addition to the report, OCTAE also commissioned supportive resources to help state and local leaders turn this research into action, including two recently-released videos on Expanding Opportunities: Aligning CTE and Apprenticeship and Elements of CTE and Apprenticeship Alignment. Later this summer, OCTAE will be releasing a planning guide, templates and mini-guides to bring all the key partners to the table. The Princeton Review recently released the findings of their annual survey of college applicants and parents discussing their perspective on the admissions process. When asked about their biggest concerns about college, the biggest worry was the debt students and their families will take on to pay for a degree. 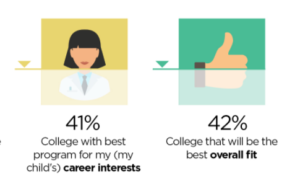 Parents and students prioritized overall “fit” and a match with the student’s career interests when choosing a college. These results fit with the perceived biggest benefit of a college education – a better job and higher income. Given this information, communications about the opportunities CTE provides in these categories would be very beneficial as students begin to plan for their futures. New America also just released national survey data about perceptions of higher education. This survey contains some promising data for community colleges. 64 percent of respondents believe that two-year community colleges “are for people in my situation.” More people (80%) believe that two-year community colleges prepare people to be successful. This is higher than four-year public (77%) four-year private (75%) and for-profit (60%). Additionally, 83 percent of respondents believe that two-year community colleges contribute to a strong workforce. This is higher than four-year public (79%) four-year private (70%) and for-profit (59%). 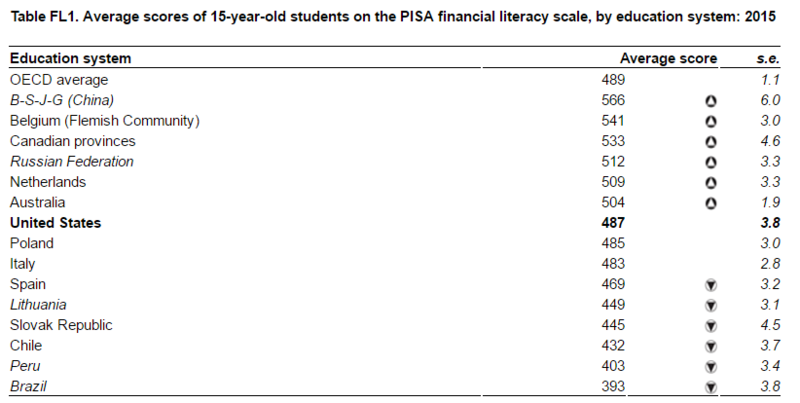 The results of the 2015 Program for International Student Assessment (PISA) exam on financial literacy have been released, and the results are less than promising. The financial literacy exam has been administered twice now to a select number of participating Organization for Economic Cooperation and Development (OECD) countries. US teens scored an average score of 487, two points below the international average. In 2012, American students received average scores of 492, while the OECD average that year was 499. Though the U.S. has scored close to the OECD average in both exams, the results are still concerning, given that an average score signifies that one in five American teens do not meet the financial literacy benchmark, and are therefore unprepared for the complex financial decisions that come with choosing postsecondary and career options. This data becomes more concerning when examined through the lens of socioeconomic status. Students from lower-income families were less likely to score high marks on the exam, indicating that schools are not doing enough to close gaps in knowledge. What is a community college degree worth? A research brief from CAPSEE aims to answer that very question. 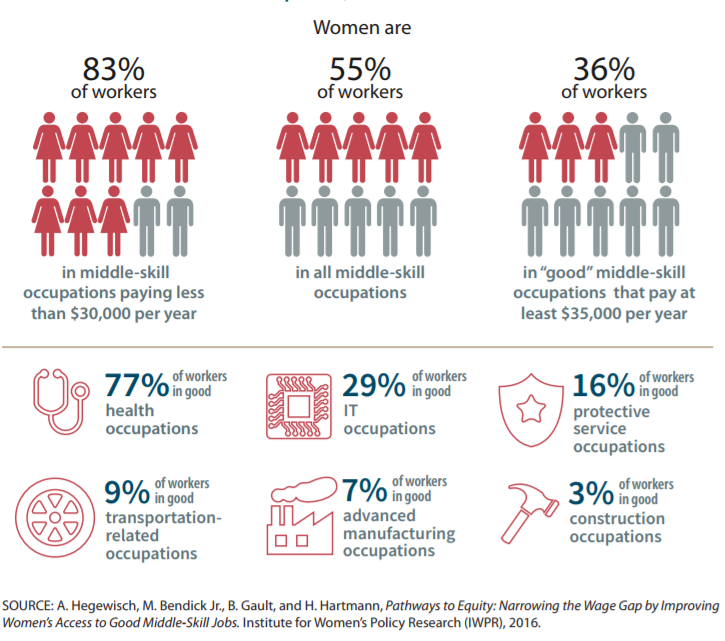 The report examines independent state evaluations and finds that, on average, the quarterly earnings for men and women earning associate degrees are $1,160 and $1,790 higher than non-completers respectively. Further, the study finds that degrees earned in vocational fields, as opposed to arts and humanities, yield higher earnings, with degrees in health-related fields the most lucrative. Speaking of skills learned in college, a recent Gallup poll — conducted for the Business-Higher Education Forum — finds that, while 69 percent of employers will prefer candidates with data science and analytics skills by 2021, only 23 percent of college and university leaders say their graduates will learn those skills. The report provides eight strategies educators and employers can use to help close the skills gap. A new study came out recently that is garnering some media attention and calling into question the long-term value of CTE for students internationally. In a nutshell, this study, General Education, Vocational Education, and Labor-Market Outcomes over the Lifecycle, finds that the labor market advantage associated with participation in vocational education diminishes over time as the vocational individuals’ skills become outdated,making them less able to navigate the ever-changing world of work, compared to those students who completed a general education (or non-vocational) path in high school. Needless to say, this is raising questions for some about what this means for U.S. CTE system. While the study raises some important questions about the consequences of a truly tracked system, it also validates the direction CTE has been going here in the U.S. In particular, this paper reaffirms so much of the exciting work going on – led by states and supported by the federal government, advocacy organizations like Advance CTE, and philanthropic partners like JPMorgan Chase – to raise the quality and rigor of CTE programs and pathways so that they serve as effective platforms to both college and careers for students. This is hugely important, but also a bit ironic. I can’t tell you how many articles I have read or conversations I have had about how we can better replicate the German model for CTE. The fact is, CTE and academics are not an either/or in the U.S. system – all high school students are still required to take an academic core and, in many states, a college- and career-ready course of study, in addition to having the option to pursue a CTE pathway. From this perspective, CTE is a “value add” to the traditional high school experience, offering opportunities for specialized, career-focused coursework, hands-on learning and access to a network of mentors inside and outside the classroom, in addition to core academics. Equally important is that high-quality CTE programs are designed to develop lifelong learners. Programs of study, by design, begin with foundational knowledge and skills and then progress to more occupationally-specific expectations over an intentional sequence of courses that extend across secondary and postsecondary. Programs of study like our Excellence in Action award winners offer opportunities for early postsecondary opportunities, meaningful work-based learning experiences and are anchored in credentials of value. These are programs not focused on short-term labor market needs – although they may fill them – but rather on the lifetime success of their students. There is undoubtedly real value in this paper. It identifies important trade-offs and offers a potential cautionary tale of focusing on the short-term needs of an economy when designing a career preparation system. 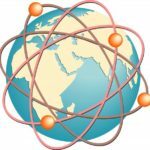 While it is important to continue to study international models – or, really study any models, policies or strategies that we think can help us get smarter about designing effective and meaningful career-focused pathways – this study also reaffirms that the efforts across the U.S. to drive quality CTE programs deserve just as much attention, if not more. Colorado and Washington both released reports recently citing positive numbers on participation dual and concurrent enrollment. In Colorado, 38,519 students, which equals 30 percent of all 11th and 12th graders, participated in concurrent enrollment during the 2015-16 school year. Nearly 40 percent of those students participated in Career Technical Education (CTE) concurrent enrollment courses, which allow students to apply credit towards a technical certificate or degree. Students passed 93 percent of all the credit hours attempted in any concurrent enrollment program. In Washington, 190,000 students, or two-thirds of Washington high school students, earned dual credit in the 2015-16 school year, which is an increase of 18,000 students over the previous year. In addition to promoting Advanced Placement courses, the state provides supplemental funding for students who enroll in college-level courses at community and technical colleges. While this is an encouraging mark of progress, state officials were quick to note that work remains to be done in closing gaps between racial subgroups. The Association of Career and Technical Education (ACTE), in partnership with Career Cruising, recently released a report and set of recommendations related to career counseling in middle schools. Research has shown that middle school is an excellent time to explore different careers and take introductory CTE courses. The report goes on to describe six recommendations, which are listed in the graphic on the right, for effective career counseling programs and dives into some of the barriers middle schools can face in providing students with quality career exploration experiences. Though many of the recommendations are focused at the local level, the authors note that state leaders have an important role to play in supporting these local innovations and practices. A new analysis out of the California Community College system finds high salary returns for students completing an associate degree. 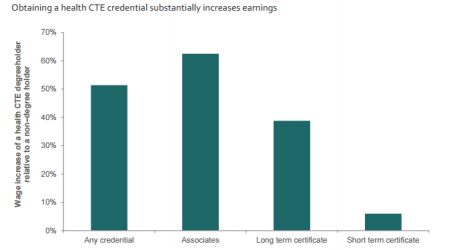 According to the study, which draws on public earnings data through Salary Surfer, 48 percent of students graduating with an associate degree and 44 percent of students graduating with a certificate earned $56,000 or more within five years of completing their credential. Twenty-three states and the District of Columbia allow computer science coursework to fulfill a core graduation requirement. That’s according to a new state scan from EDC and other research organizations examining state strategies for writing, adopting and implementing computer science standards. The report describes state policies related to ten policy priorities and identifies common challenges and approaches across the states. A survey of entry-level employees, conducted by the Rockefeller Foundation and Edelman, finds that 49 percent of employees aren’t using skills they learned in college while 90 percent feel they are using skills they learned on the job. The authors suggest that screening candidates based on college degree may limit the talent pool and cut off high-quality employees who could be trained on the job. The Every Student Succeeds Act (ESSA) affords states the chance to strengthen their accountability systems by adopting multiple measures of school success rather than relying on an antiquated test-based system. Buoyed by this flexibility, state agencies across the country are exploring strategies to integrate career readiness indicators into their accountability systems. While some states have made considerable progress in this arena, others are left wondering where do we start? The brief further outlines strategies for measuring and valuing each of these measures, demonstrating how states can implement and gradually increase the sophistication of their measurement indicators. Lessons are also drawn from states such as Ohio, Kentucky and California that have made headway toward adopting and implementing career-focused accountability indicators in recent years. Moving forward, JPMorgan Chase & Co. aims to support state efforts to adopt these recommendations and enhance their career-focused accountability through New Skills for Youth, a cross-state initiative to dramatically increase the number of students who graduate from high school prepared for careers. Separately, students who earned dual credit in Oregon schools were more likely than their peers to graduate from high school, enroll in college and persist through their first year. That’s according to new research from the Research Education Lab at Education Northwest examining dual credit participation between 2005 and 2013. While the study reveals a correlation between dual credit attainment and positive outcomes, the authors note equity gaps in participation across student subgroups. 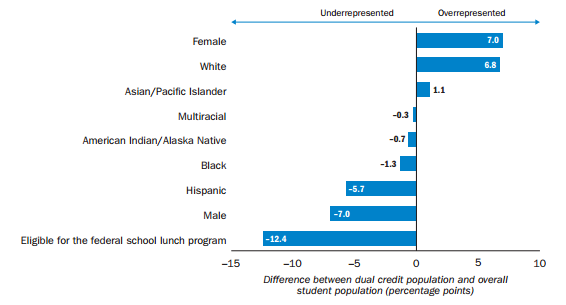 Dual credit earners in the study were more often white, female and not on the federal free and reduced lunch program. Equitable access to higher education is not a new issue, but it can often be exacerbated by performance-based funding formulas. Without careful design, such formulas can encourage two-year and four-year colleges to be more selective with who they admit into their programs. According to the Center for Legal and Social Policy (CLASP), states should adjust their postsecondary formula weights to counteract selectivity and encourage more open access to postsecondary education. The Education Commission of the States published an analysis of State Longitudinal Data Systems, highlighting common approaches and challenges to instituting cross-system data sharing systems. The brief profiles successes in Connecticut, Rhode Island and Wisconsin. A study out of Mississippi State University exploring perceptions of CTE found that 45 percent of Mississippi residents were unable to name a single CTE program in their area. The authors put forward a series of recommendations including calling on educators to actively promote the many benefits of CTE participation, such as highlighting college-bound students, program flexibility, fast-track to careers and high-skill, high-demand job opportunities. Two years after the California legislature launched the Career Pathways Trust — a $500 million grant program to finance collaborative career pathways — Jobs for the Future has released a summary of common successes and challenges across different grant sites. A new paper from the Workforce Data Quality Campaign provides a quality assurance framework for short-term occupational training programs and makes recommendations for state and federal policymakers to strengthen such programs. Two reports from America’s Promise Alliance, Relationships First and Turning Points, explore the role that relationship building plays in guiding students along their career pathways. The reports — the first two in an ongoing series — highlight Cafe Momentum in Dallas, TX; Per Scholas in the Bronx, NY; Urban Alliance in Washington, D.C.; and Year Up in the Bay Area. A new study from the Online Learning Consortium examines six institutions in the United States that are experimenting with alternative credentialing strategies to provide flexible postsecondary learning opportunities, including digital distance learning and prior learning assessments. The report makes a distinction between measuring college retention and college persistence, as retention only measures how many students return for the following Fall semester at the same institution. Using persistence as a measure for community colleges captures the large number of students who transfer either to other community colleges or to four-year institutions. This requires a more systematic approach to tracking enrollment across different institutions and across state lines. 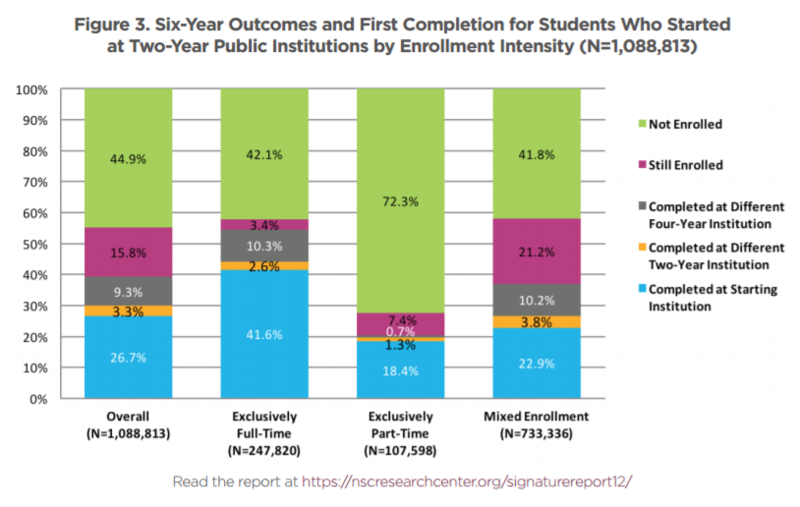 When enrollment was tracked this way using Student Clearinghouse data, they found that almost half of all bachelor’s degree recipients were enrolled in a community college at one point before transferring to a four-year institution, a fact that demonstrates the clear role community colleges play in student success. A new report published in Science found that girls tend to turn away from STEM subjects as early as first grade. The report attributes this partly to their findings that girls begin to associate boys as being smarter and therefore tend to shy away from subjects intended for more intelligent people. Boys around that age seem to also believe themselves to be inherently smarter. The findings in this study echo previous studies that correlated boys’ and girls’ performance in math and science with their self-reported levels of confidence and anxiety with the subjects. The authors of the report suggest that schools must begin working to break down gender stereotypes far earlier than many might expect. They also recommend that families work to foster girls’ interest in STEM subjects as early as possible. As you know, last month was CTE Month. To celebrate, the National Center for Education Statistics (NCES) launched a newly redesigned CTE statistics website, which provides national-level information on CTE at the secondary and postsecondary education levels, as well as information on occupational certification and licensure. Several pieces related to equity have been released lately. CCSSO and the Aspen Institute released a report on the role SEA chiefs can and should play in defining and promoting equity in schools. Chiefs For Change also released a report on equity, with a focus on using ESSA and financial transparency to improve equity. The U.S. Departments of Labor and Education recently released a technical assistance document to support communities working with in-school youth in accordance with WIOA. Additionally, the National Conference of State Legislatures launched a database that tracks state legislation related to WIOA implementation. In 2015, the most recent year data are available, CTE students nationwide graduated at a rate of 93 percent — approximately 10 percentage points higher than the average. Now, new research from Wisconsin and Washington adds to the growing body of evidence that secondary Career Technical Education (CTE) leads to positive postsecondary outcomes. CTE Concentrators were six percentage points more likely to graduate from high school than non-participants. Approximately 74 percent of CTE Concentrators went on to pursue further education, with about one-third attending a 2-year school and two-thirds attending a 4-year school. Of those attending higher education, 72 percent reported pursuing fields of study related to their high school CTE courses. However, the data revealed inconclusive results related to performance on academic assessments. Additionally, the report identified a 6.3 percent statewide decrease in CTE teaching assignments from 2009 to 2016 — a trend the state has been working to reverse through recent legislation making it easier for CTE teachers to get certified in the state. 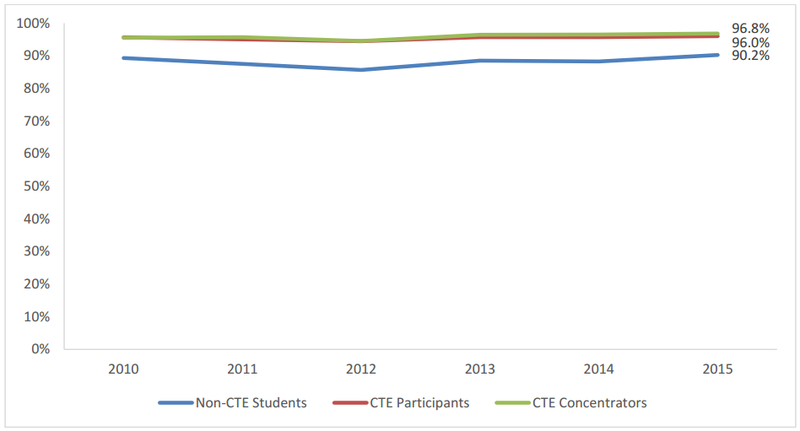 A report from the Washington State Auditor’s Office examines outcomes data for students in both the 2012 and 2013 graduating high school classes and finds that secondary CTE students demonstrated high post-high school achievement. The study was commissioned to examine the impact of Washington state’s $400 million investment in CTE — a system that reaches 300,000 high school students statewide. The study finds that, within the population of students that did not go on to a four-year degree, CTE students were 11 percent more likely to “achieve” than non-CTE students. According to the study, “achievement” is measured as persistence in apprenticeship programs, persistence in community and technical colleges, employment and certificate attainment. Additionally, CTE programs accommodated a higher proportion of students receiving free and reduced price lunch and students with disabilities than other non-CTE programs, indicating that CTE could be a strategy for students of all socioeconomic backgrounds and abilities to acquire the skills needed for high-demand, high-wage careers.